Foreign Ministry confirms: Danny Danon to remain UN Ambassador until February. Israeli Prime Minister Binyamin Netanyahu has decided to lengthen Israeli Ambassador to the United Nations (UN) Danny Danon's term by six months. 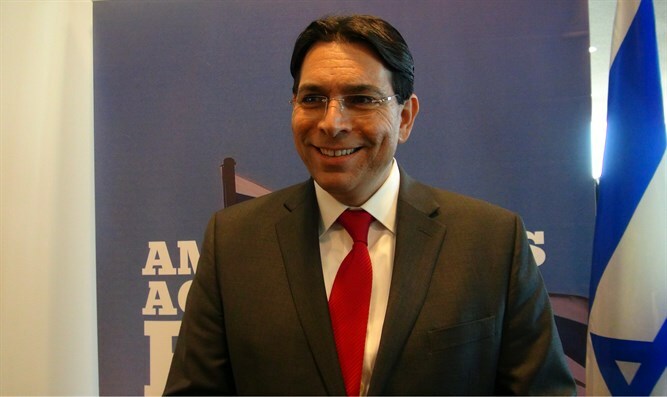 Speaking to Arutz Sheva, the Foreign Ministry confirmed that instead of ending his term at the end of August, as scheduled, Danon will continue to serve as UN Ambassador until February. Senior diplomatic sources noted that Netanyahu's move is an expression of trust, and proves Danon has seen "unusual success during one of Israel's difficult periods at the UN." Previously, Danon had requested a one-year extension of his term, which began in 2015. Upon his return to Israel, Danon plans to go into politics, rejoining the Likud and running in the party's primaries. In recent years, Danon has succeeded in breaking several glass ceilings: In September 2017, he was the first Israeli to be appointed Vice President of the UN General Assembly, and in June 2016, he was appointed head of the United Nations Legal Committee, becoming the first Israeli to ever head a UN committee.